Catherine Beddall is, quite simply, a gingerbread mastermind. Forget basic little houses covered in gumdrops — Beddall is a food artist and gingerbread is her favourite medium. From an antique clock to space rockets and even a chess board, there’s no limit to Beddall’s creative designs. With Christmas on the horizon, the Ingenium Channel caught up with this award-winning pastry chef to learn more about her gingerbread obsession — and to glean some beginner tips. I understand you recently placed second in a major gingerbread competition — congratulations! Can you tell me about that experience? Thank you! It was just an amazing experience from start to finish. The event is called The National Gingerbread House Competition, and it's held at the Grove Park Inn in Asheville, North Carolina. This is its twenty-sixth year! It's grown to become North America's biggest gingerbread house competition, and attracts competitors from all over the U.S. and Canada. The Grove Park Inn is a beautiful historic hotel, so just staying there was great in itself, but to be there for the competition — let's just say that it's something I've dreamed of doing for years. To place second was such a great honour, as was meeting so many talented gingerbread artists. The calibre of the work I saw there was just out of this world. Catherine Beddall's award-winning entry in the National Gingerbread House Competition was called "Hickory Dickory Dock." Describe your prize-winning entry — and how you came up with the idea. My entry was called “Hickory Dickory Dock” and it was based on the well-known nursery rhyme. My vision was to create an “antique clock” to look like it was elaborately carved out of wood — beautifully decorated for Christmas with candles, holly, white roses, and gold Christmas ornaments. The clock is inhabited by a little family of mice; two of the mice are building their own little gingerbread house inside the clock, one is helping to decorate the outside, and one is running down — because it's one o'clock! Everything is edible and made from either sugar, chocolate, or gingerbread. You've been involved with gingerbread contests before, haven't you? Tell me about the other competitions you've been involved with. Yes, I've won a few gingerbread competitions in the Ottawa area — the Canada Mortgage and Housing Corporation Gingerbread House Competition in 2011 and 2012, the Canadian Gingerbread House Championship at Upper Canada Village in Morrisburg in 2012, and the Homes for the Holidays Gingerbread Village Builders Bake-Off in 2016. I love competitions! You're a trained pastry chef with a wide range of experience creating cakes, cookies, and pastries...why do you love gingerbread so much? I have a special place in my heart for gingerbread; it’s part childhood memories, part a love for architecture, and part a love for miniatures that attracts me to it as a baking and decorating medium. I've always loved looking at houses, and with gingerbread I can create so many different little homes that it's so fun to imagine living in. But gingerbread doesn't stop at houses; it’s such a versatile medium and I've used it to create everything from a robot, to a rocket, to a motorcycle! With gingerbread, there's no limit to where your imagination can take you. At this time of year, a lot of amateur bakers try their hand at making gingerbread houses — and it's something that many people find really challenging. What are your top tips for beginners? My absolute number one top tip for beginners would be to take at least two days to build your project! 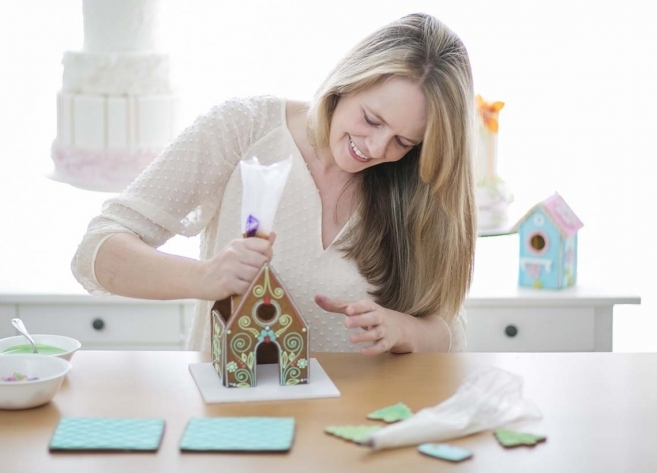 Use royal icing to “glue” your house together — it's a special type of icing that dries hard, but it needs a few hours to set. I'd suggest building your walls on day one, letting them dry overnight, and then adding your roof on day two. Have fun, don't get frustrated — and make sure to eat lots of candy while you’re building! Tell me about your book, The Magic of Gingerbread. The Magic of Gingerbread was published in 2017 and it remains one of my proudest accomplishments! It includes 16 gingerbread projects for everyone, from beginner to advanced, and all the tips and recipes you need to successfully bake and build a wonderful gingerbread creation. If you’re in Ottawa, you can pick it up at Connections, the bookstore at Algonquin College, or you can buy it online from Amazon. Tiny mice, made of sugar, sit inside the gingerbread clock. A side view of Catherine Beddall's award-winning gingerbread creation, "Hickory Dickory Dock."